The sardine fishery, once the lifeblood of many East Coast towns, is now closed due to species collapse. Sardinia is an immersive installation that conjures the sheer abundance of the past. Using video, audio, and sculptural elements, Sardinia projects thousands of sardines swimming, without end, across a vaulted ceiling. 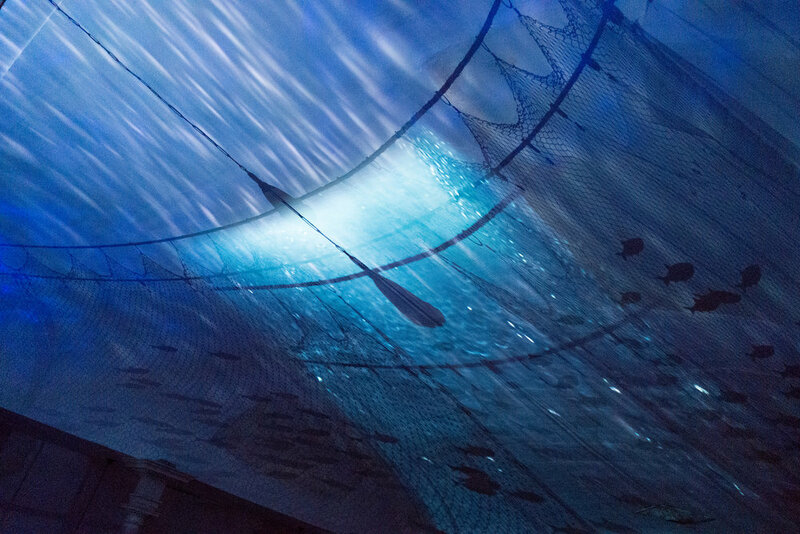 Fishing nets, lace textiles, a school of fish created by many hand-made individual sardines, a mesmerizing film projection by Ryan O’Toole and a haunting original sound composition by Charles Harding (Property//) and David Cheney work together to provide an otherworldly experience for the viewer. Documentary footage (by Tom Cheney) of Janice Wright Cheney’s Sardinia, a multimedia exhibition installed at North Church in Eastport, Maine, summer 2016. Film editing by Ryan O’Toole and original sound composition by Charles Harding (Property//) and David Cheney.